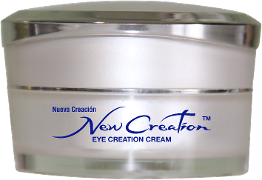 Make the effects of aging go away with help from the anti-wrinkle eye cream from New Creation Products. The New Creation Eye Creation Cream is made from a combination of natural ingredients and modern technologies derived from natural sources, peptides, and vitamins and is fragrance free, paraben free and colorant free. Great for all skin types, our hypoallergenic cream significantly dimishes dark circles and puffiness from around your eyes. 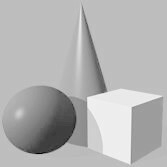 It also reduces wrinkles, crow's-feet, and dark lines. We recommend this treatment for all ages to prevent the signs of natural aging. With our Formulator, who has over 40 years experience in the cosmetic industry, we at New Creation Products wanted to develop a product that would address wrinkles, dark circles, and puffiness around the eye area as well as moisturizing the skin in a single application. Many products on the market today contain ingredients that do not work but look good on the label and address only one problem area, for example you use one product for wrinkles, one product for dark circles, and then another for puffiness. Now, 10 minutes of your time has gone by just to apply these products! With our New Creation Eye Creation Cream, ONE application of ONE product works on your wrinkles, dark circles, and puffiness as well as moisturizing the skin. New Creation Eye Creation Cream is an All-In-One eye product! Because we have spared no expense in manufacturing this anti-wrinkle cream, we are confident you will love the results. Ingredients: Purified water, heptyl undecylenate, Aloe Vera gel, glyceryl stearate, cetearyl alcohol, sodium stearoyl lactylate, diheptyl succinate (and) capryloyl glycerin/sebacic acid copolymer, Kosher Glycerine, Palmitoyl Oligopeptide, Palmitoyl Tetrapeptide 7, Albizia Julibrissin Bark Extract, Darutoside, Collagen Amino Acids, hydroxypropyl cyclodextrin, Acetyl Hexapeptide 8, Caprylhydroxamic Acid, phenoxyethanol, methylpropanediol, Heptapeptide, Vitamin E , Vitamin K, Hyaluronic Acid, Pyrus Malus (Apple) Fruit Extract.